e-commerce: from a cannabis sale to everyday use. “The seminal act of e-commerce” took place in 1971 over ARPANET (an ancestor of today’s internet). Of all things, it was used to arrange a cannabis sale between students at the Stanford Artificial Intelligence Laboratory and the Massachusetts Institute of Technology. It then took almost a decade for the first online shopping system to come online and another fifteen years for amazon.com to take a seat at the table. Today, almost everyone looks forward to the UPS knock on the door followed by the sound of a cardboard package being dropped off by the doorstep. 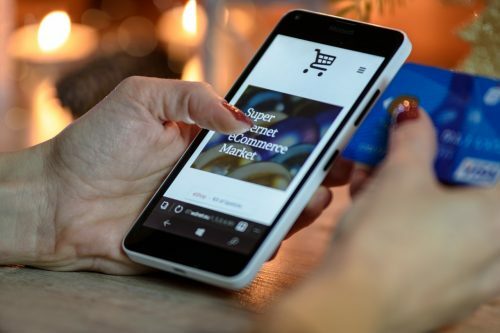 Compared to its humble and… colorful beginnings, e-commerce has come a long way and is now accessible to single-product mom n’ pop shops and large international online retailers alike. That being said, having a product to sell and willing buyers are only parts of the necessary elements to having a successful e-commerce site. The platform you choose for your e-commerce store is crucial to the success of your business. Assuming you are hoping to set the world ablaze and become a mid/large player in the e-commerce game, there is in fact an e-commerce platform that stands head and shoulder above the rest: Magento. Magento’s lead over the rest of the pack is substantial. Based on the chart below, by combining Magento Community Edition (open-source version) and Magento Enterprise (premium version), their market share amounts to 20% (for the top 10k sites). In real terms, this means that the world’s largest and most successful online retailers overwhelmingly chose Magento as their e-commerce platform. 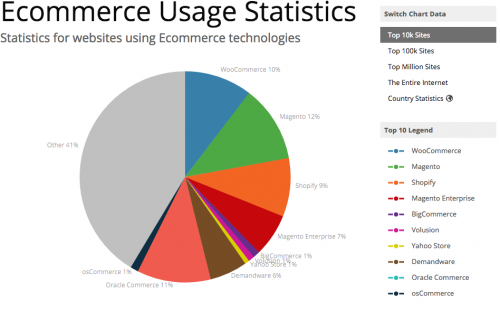 These statistics change dramatically if we broaden the data to the entire internet as a lot more mom n’ pop shops get added to the pool, however this chart gives us an accurate representation of what the best of the best use as their solution of choice: Magento. We’re also going to assume that since you’re planning on taking over the e-commerce world, you will need the Watermelon Web Works team by your side to do so. Magento is the clear choice as far as we’re concerned from a developer standpoint. If we compare Magento to other platforms such as Shopify, a few of the elements that stand out to us are the availability of community support, potential for customization and most importantly, scalability. Proprietary systems such as Shopify are great platforms in their own right and under the right circumstances, might be the best option to choose (e.g mom n’ pop, small to low mid range stores, single-product retailers, etc). However Magento is best suited for larger, high volume stores with thousands of SKUs and is pre-built for things such as ERP integration through the use of RESTful APIs. Hence much greater potential for growth and smooth scalability. Most platforms have an active community and considering Magento is open-source, the community is large and very helpful which is a tremendous benefit to ensure you do not find yourself at a dead end. Opting for Magento over other e-commerce platforms is like buying a house over renting an apartment. Sure the apartment might seem more convenient and less involved initially but buying a house will allow you to customize it as you see fit, keep building if need be and you’ll get to know your community well rather than just nodding to your neighbors in the elevator. The long term potential and satisfaction is much greater. Magento is an impressive and powerful system by itself but thanks to the availability of a variety of powerful plugins, it will integrate nicely with WordPress. Even though the architecture between WordPress and Magento is different, the programming languages are the same for both. Therefore, there is some clear overlap and from a developer standpoint, that means anything is possible! If you are looking at creating a custom plugin, redesigning a website, adding an e-commerce platform for your existing site, or developing a new one from scratch, make sure to contact us for a quote so we can answer your questions and show you exactly how we can help you reach your goals.